The new STEIGER ® TBR 220 features impressive performance capabilities and is extremely compact. It is the ideal work platform when working in cramped, inner- city conditions. 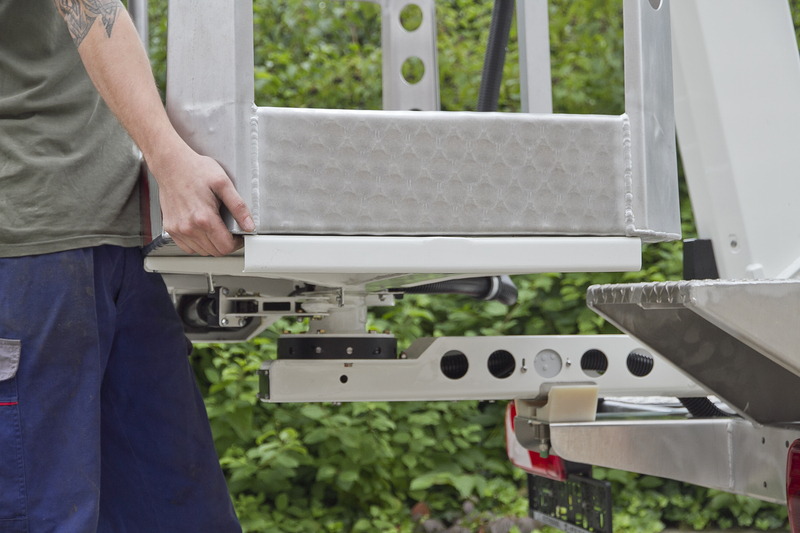 The low height of the work cage console allows operators to get extremely close to objects. Installation or repair work can be carried out in a safe and efficient manner. 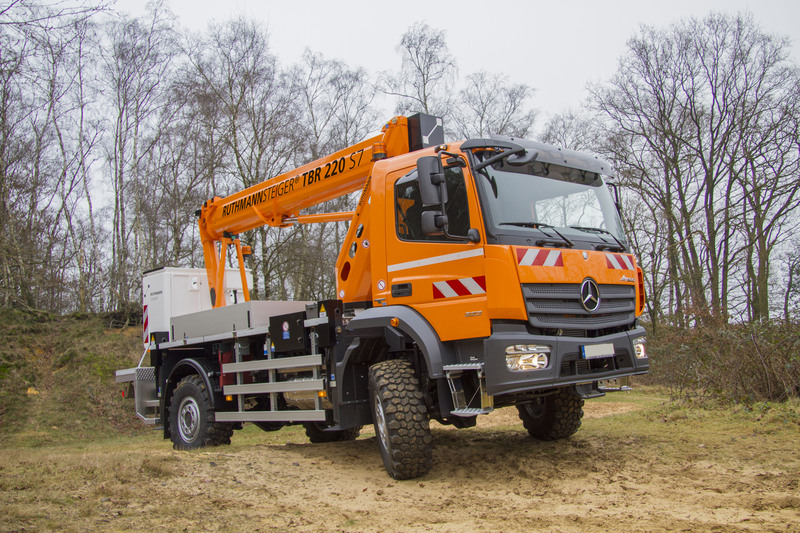 The TBR 220 is the new -range champion- in the 3.5 t truck-mounted aerial work platform category. 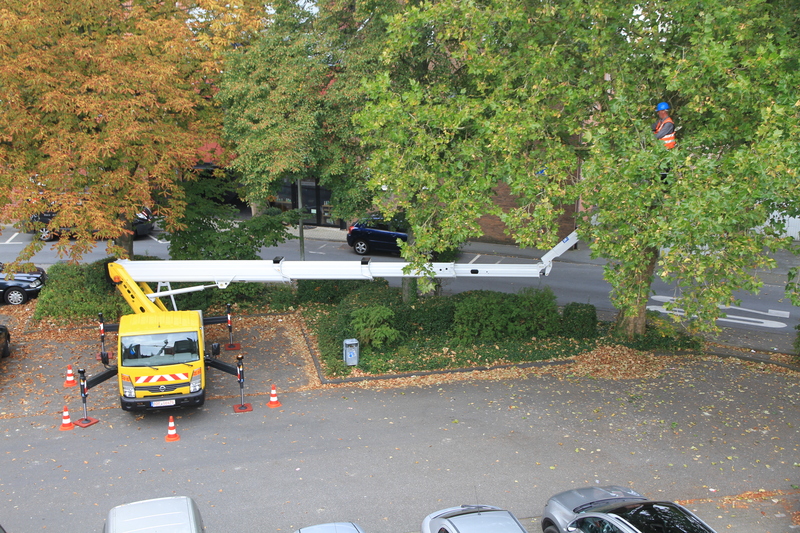 On tree cutting - pruning assignments, for example, falling branches do not pose a hazard to the vehicle or outriggers because the vehicle can be positioned at a safe distance. 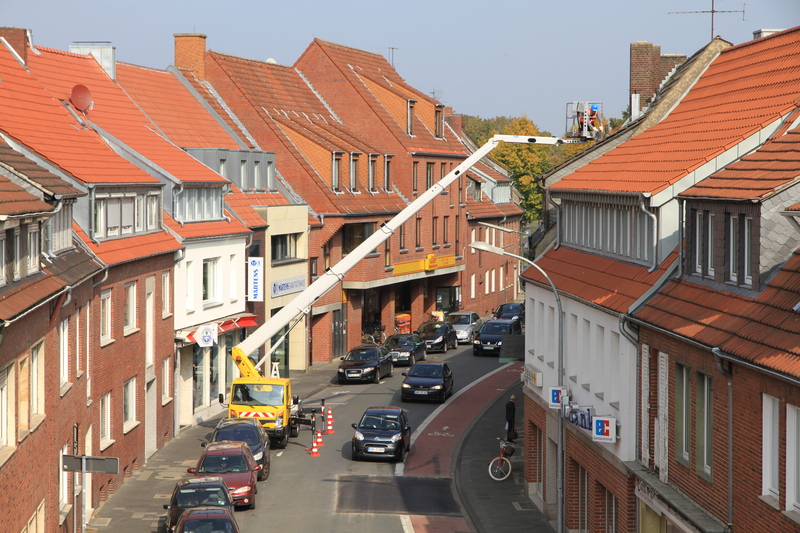 The movable jib -RUESSEL ®- has a swivelling range of 185° for maximum versatility at the job site. Objects can be reached with great precision and sensitivity. Assignments can even be carried out BEHIND objects. 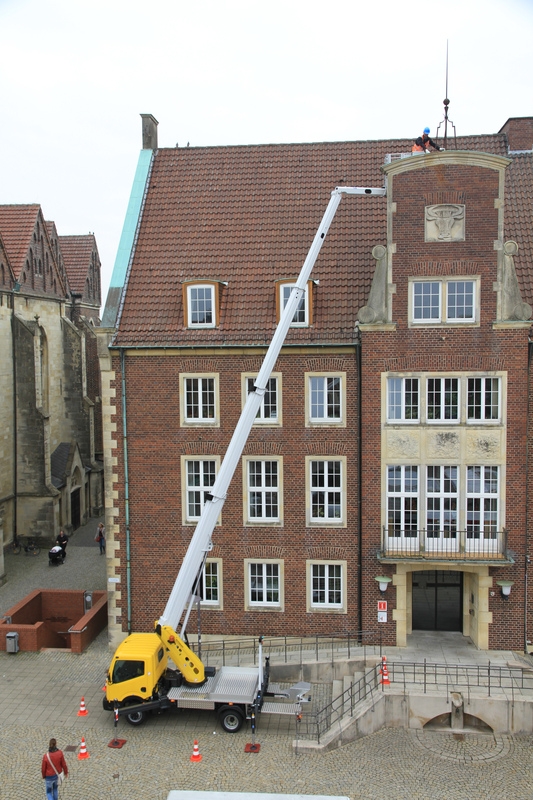 With a working height of 22 metres, the STEIGER ® TBR 220 can carry out assignments on larger buildings, trees, and other objects. The TBR 220 features an interchangeable work cage system which allows operators to choose between the standard aluminium cage and the optional, double-insulated 1000V synthetic cage when working on power lines. 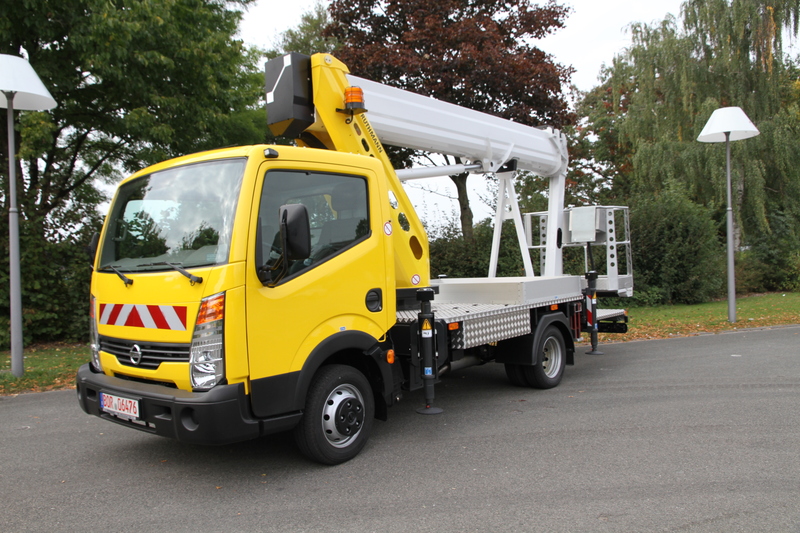 This makes the TBR 220 the vehicle of choice for municipalities and electric power companies. Because the new STEIGER ® TBR 220 can be driven with a B/3 driver’s licence, they can be rented to anyone with a legal driver’s licence. Even trainees/apprentices are able to drive the vehicle to the job site. The RUTHMANN STEIGER ® TBR 220 has so many amazing state-of-the-art features and performance capabilities that it will soon be replacing many older models in the 7.49 t category. -HV5- or -S7- versions of the TBR 220 can also be ordered for even greater load capacity and/or all-wheel drive capabilities.In the S7 version (pictured), the TBR 220 can be mounted onto 7.49 t – 9 t (GVW) trucks including the Mercedes-Benz Atego (four-wheel drive and two-wheel drive) or MAN TGL (two-wheel drive). The -S- in this type of support stands for -senkrecht-, which is German for -vertical-. Vertical support means that the four hydraulic support cylinders are attached directly to the base frame of the STEIGER ®. The work platform is stabilized within the contours of the vehicle. 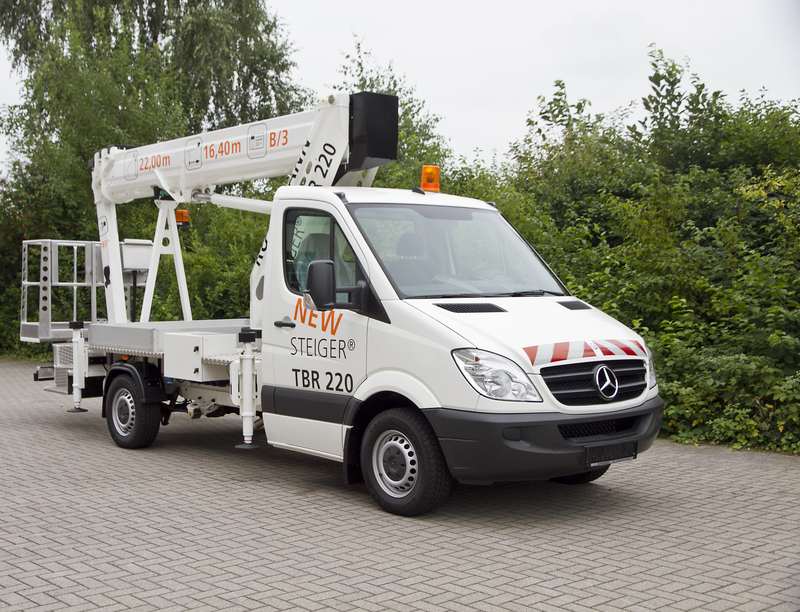 With the TBR 220 -HV5-and -S 7- versions (pictured), RUTHMANN is attracting customers outside the work platform rental business. With its incredible load capacity for tools and materials and off-road capabilities that facilitate maneuvering/working in rough, uneven terrain, the TBR 220 is the perfect work platform for municipalities, electricity providers, and builders. 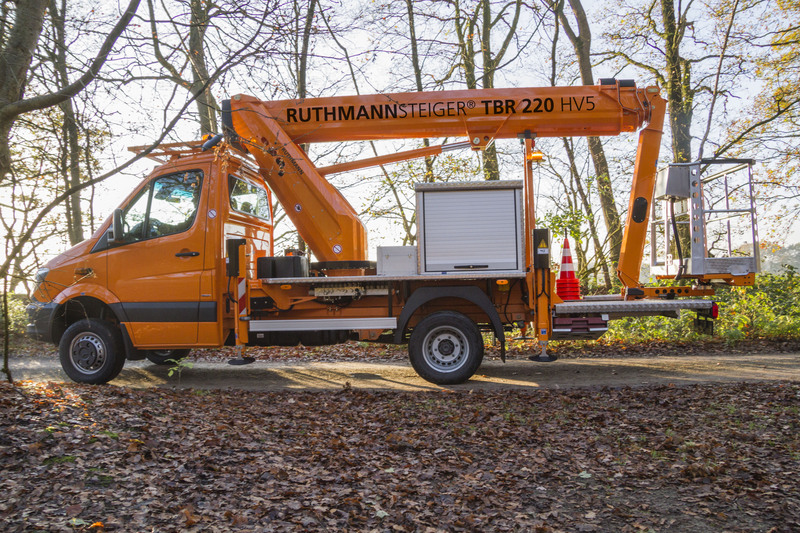 With the TBR 220 -HV5- (pictured) and -S 7- versions, RUTHMANN is attracting customers outside the work platform rental business. With its incredible load capacity for tools and materials and off-road capabilities that facilitate maneuvering/working in rough, uneven terrain, the TBR 220 is the perfect work platform for municipalities, electricity providers, and builders. 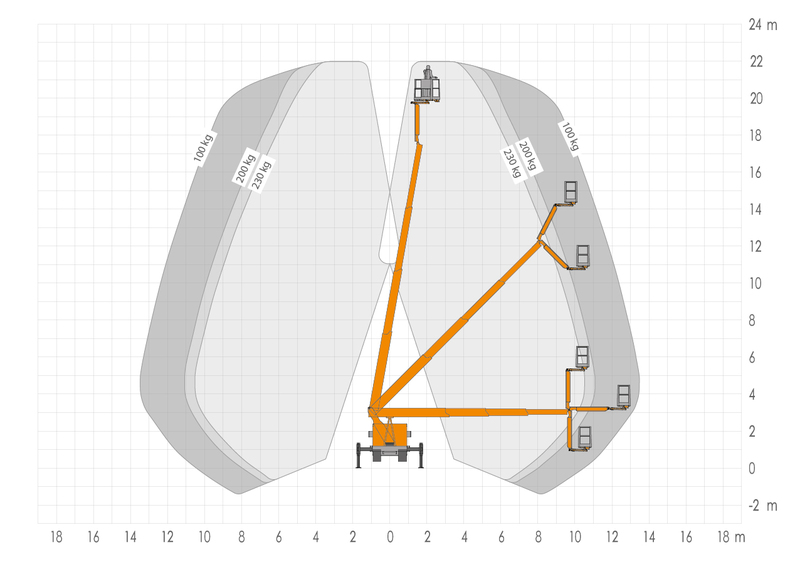 HV5- or -S7- versions of the TBR 220 can also be ordered for even greater load capacity and/or all-wheel drive capabilities. In the HV5 version (pictured), the TBR 220 can be mounted onto 5,5 t (GVW) trucks including the Mercedes-Benz or IVECO. The -HV- in this type of support stands for -horizontal/vertical. So the support profile can be selected depending on the operating. The new TBR 220, which has been developed specifically for the 22 m class, is based on RUTHMANN’s time-tested telescopic boom technology also utilized in the TB, T, and HEIGHT performance-series. The STEIGER ® TBR 220 fulfills long-awaited customer requirements. 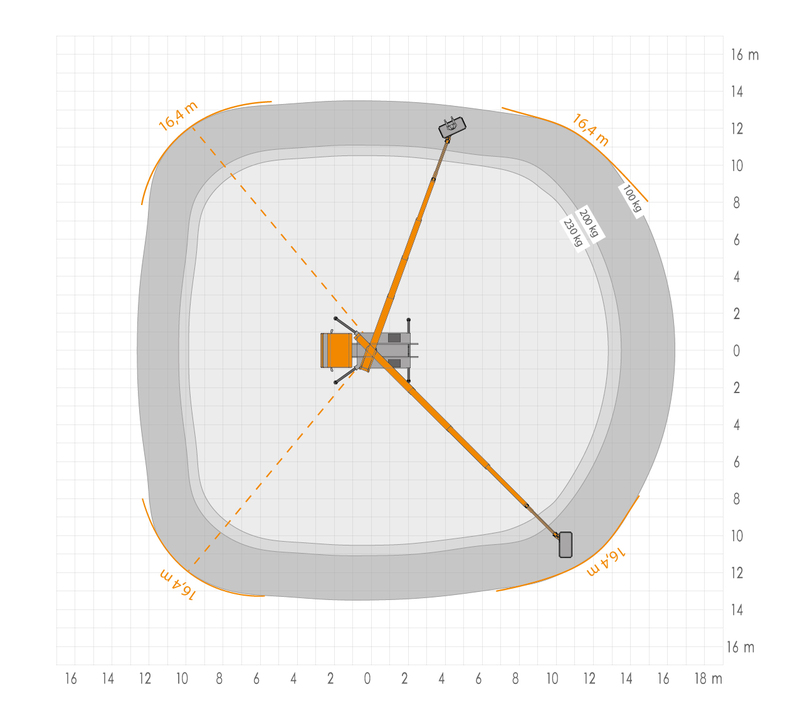 The movable jib (RÜSSEL ®) is 2.2 m long and has a swivelling range of up to 185°. This greatly increases agility and maneuverability when working on and behind objects. The telescopic cylinder and power supply have been integrated internally in the innovative boom system. 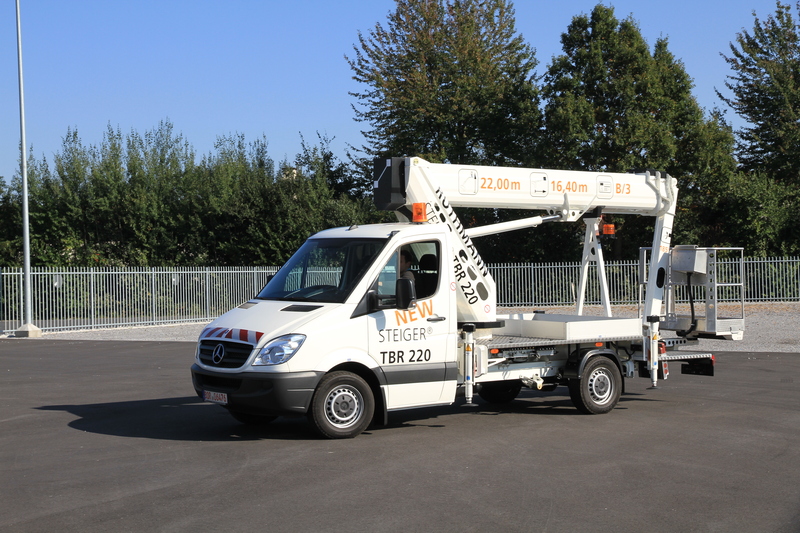 The TBR 220 has an incredible 16.4 m lateral reach and 22 m working height. Together with the generous 230 kg cage load capacity, this STEIGER ® model is able to carry out daily assignments with utmost efficiency. The boom system is made of state-of-the-art, fine-grained steel and the proven, multi-bevelled technology provides maximum stability/buckling strength. The low-lying work cage console, 2x85° cage rotation device, and new slip-resistant aluminium floor and steps, have further increased the level of safety and efficiency of this STEIGER ® model. The TBR 220 comes equipped with the innovative “space frame design” tower resulting in a 20% weight reduction. Innovative steel construction minimizes weight and maximizes buckling strength. Other weight reducing measures have also been implemented. The reduced overall weight offsets the extra weight of the new EURO 6 base vehicles. The TBR 220 also features a new, interchangeable work cage system. Operators can use the aluminium or synthetic work cage, depending on the assignment. 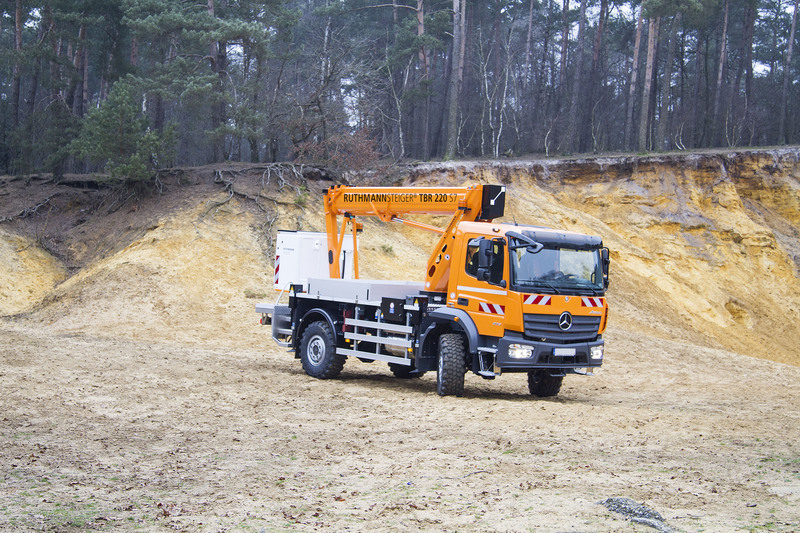 Until now, this feature had only been available on truck-mounted aerial work platforms in the 7.49 t category. This versatile STEIGER ® model is perfect for rental companies. 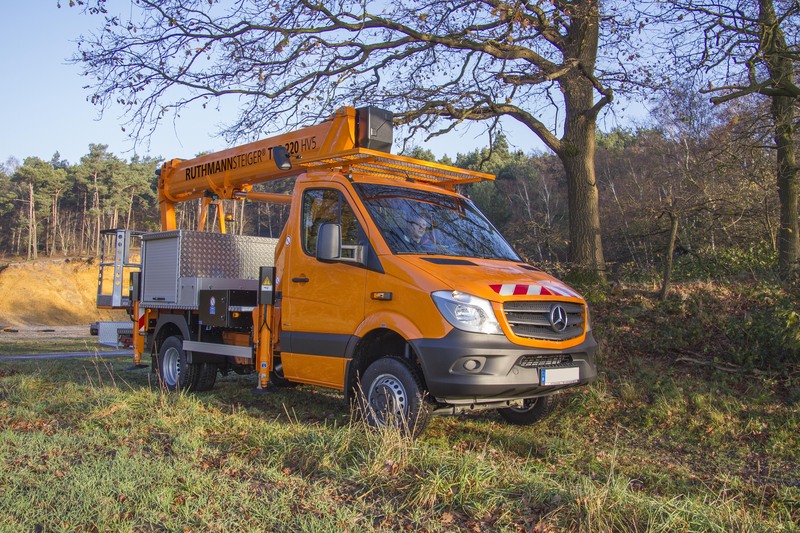 They can rent the same work platform to tree cutters and to electricians, thanks to the insulated 1000V synthetic cage. As with other RUTHMANN models, there is a wide range of base vehicles from which to choose from. The TBR 220 can even be mounted onto chassis with greater vehicle load capacity and 4-wheel drive systems. The short wheelbase facilitates easy handling in cramped, inner-city traffic conditions. Other notable characteristics of the STEIGER ® TBR 220 include: horizontal/vertical support mechanism (outriggers can be extended within the contours of the vehicle, on one side only, or fully), positioning on sloped surfaces of up to 5°, multi-motion operation (lifting, swivelling, and telescoping occurs simultaneously). Set-up time is greatly reduced and operational speed has been maximized. Contact us by phone, fax, or email. Let us show you the amazing performance capabilities, uses, and advantages of our tried and tested STEIGER ® models. A STEIGER ® for Everyone!